on June 16 | in Blog, Company Announcements, Local, Team Blue | by karla | with Comments Off on Introducing Regine! Introducing Regine — our newest member of Team Blue! I’m so excited to announce Regine Nelson as Sky of Blue’s new Inside Sales Representative. When our marketing director Darilyn Kotzenberg and I set out to find the perfect candidate a few months ago, we had no idea the planets would be aligned just right and Regine Nelson would be in search of a company such as ours to work with. She and I met over coffee and I was so impressed with not only her résumé, amazing intelligence and skill set, but with her warmth, sincerity, and thoughtful spirit. We had an instant connection and after we parted that day, every time I’d recall bits of our conversation I’d smile. Needless to say I was thrilled when she accepted the job. Regine comes to us with a world of experience. She is the founder of Allure Marketing + Communications and worked with Yahoo, the City of Los Angeles, Adobe Systems, NetApp, and PayPal to name a few. 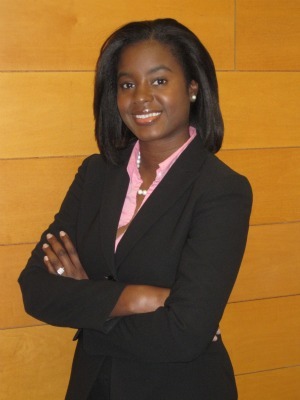 She also founded the highly successful MyBlackTresses.com. She is originally from Miami, but moved here to Menlo Park in 2010 from Chicago with her husband Christopher. They have a 2 1/2-year old son named Jacob, as well as 1-year old twins Joshua and Alexander. Yes, you read that right. She’s a super-star working mom who also speaks fluent French, Spanish, Haitian Creole, and English, and is a member of the Menlo Park Presbyterian Church, the Junior League, and on the Library Commission. So yes, in between taking care of her darling family and being an active citizen of our community, she will be happily doing her part to help grow Sky of Blue Cards. Her job with us includes taking care of our current customers (who aren’t currently serviced by a member or our outside sales team), contacting potential new customers, and working with current and new large accounts. I have no doubt our customers will adore her as much as we do. A big, huge WELCOME to Regine!